April 7 - 13, 2019 is National Library Week! We will have activities to celebrate all week. 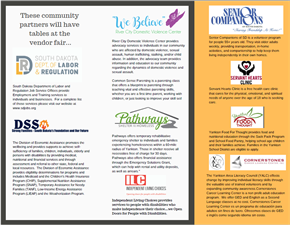 To kick the week off, we are hosting a Community Resources Vendor Fair. We are frequently asked about where to find help on different topics, and we are more than happy to share contact information. Since the theme this year is Libraries = Strong Communities, we thought it would be great to bring the resources to you at the library! There will be 12 agencies represented, with additional print material about personal issues and counseling centers. 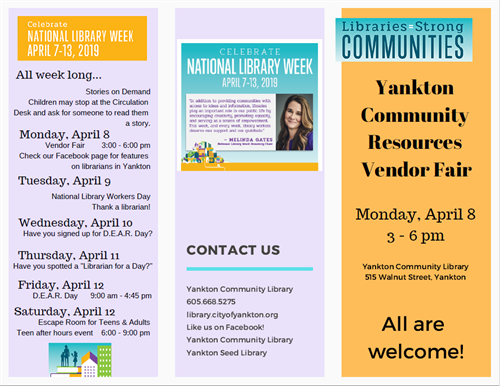 Whether you or someone you know are in need of assistance from some of these resources, or just want to know more about what they offer, please join us between 3:00 pm and 6:pm on Monday, April 8th. Please spread the word...everyone is welcome!